AUSTRIA, Europe -- Birthplace of the 18th century composer Wolgang Amadeus Mozart, film location for The Sound of Music, and designated a world heritage site by UNESCO in 1997, the Old City of Salzburg in Austria is one of the loveliest places in Europe. Crowned by a fortress which is visible for miles, the Old City features buildings in a variety of architecture styles dating from the Middle Ages, Romanesque, Baroque, and Renaissance periods. With no shortage of imposing buildings such as the Mirabell Palace, an impressive cathedral, and the Hohensalzburg Fortress, a visit to historical Salzburg is a 'must' if you are golfing in the area. And to experience the Old City at its best, take a Fiaker (horse and old carriage) tour while you're there. Nestling in central Europe, Austria is bordered by several countries - Germany, Switzerland, Italy, Slovenia, Hungary, the Czech Republic and Slovakia - and the province of SalzburgLand is located just about in the middle of the country. It's hard to imagine that a country which is renowned for its ranges of huge mountains and superb ski resorts also has a great variety of golf courses - but there's no need to worry, the courses are not perched precariously on mountainsides ... and they don't resemble roller-coaster rides. A few are as flat as a board, some have stunning mountain scenery, and others have been laid out around lakes - and at most of them you'll find English or English-speaking golf professionals. But inevitably in this mountainous country, as in Colorado, the golfing season is short and in SalzburgerLand this starts April/May time and ends October/November when golf clubs give way to skis. Just a few miles from Salzburg is the exclusive Gut Altentann Golf & Country Club, which was the first course Jack Nicklaus designed in Europe. It's well landscaped and undulating where marshes, lakes, and streams come into play on several holes. With its stylish clubhouse, open log fire, large restaurant, 'mini-club' for children, and sun terrace overlooking the course, it's no surprise the club is considered one of the finest in Austria. At nearby Eugendorf GC, don't get excited with an easy birdie on the 1st hole - a short downhill par 4 - as without a good drive on the dogleg 2nd (an uphill drive and second shot over a gorge) you could be facing an even easier double-bogey. Now you wouldn't expect to find an old-fashioned English red telephone box in the middle of a golf course in Austria, would you? But this is exactly what you'll find beside the 9th tee. It's here you really need to concentrate - not on what iron you should take to the tricky par-3 green in order to avoid the deep valley and huge bunkers protecting the green, but on what you want to order for lunch ... by telephone. Located in the heart of the beautiful Salzkammergut Lake District, Bad Ischl GC used to be the playground of the European aristocracy for many years after its opening in 1934, when regular guests included the Duke of Windsor, the King of Belgium, and Queen Friederike of Greece. It's one of the oldest clubs in Austria and very hilly in places - especially on the 16th which has a pull-lift for you and your trolley if you need extra help to climb the steep fairway. Another hilly course set above Lake Fuschl, but one worth mention even though it has only nine holes, is Schloss Fuschl GC. It's one of the oldest courses in Austria, set out on an historic site dating back to the 15th century - where Emperor Maximilian I, Wolfgang Amadeus Mozart, Prince Rainier of Monaco, and Richard Nixon have all stayed - from which golfers can enjoy breathtaking views of the lake below and surrounding mountains. Getting the 'Birdie Jet' - a golf cable car - from the 11th green to the 12th tee is a novelty at Radstadt GC, a challenging 18-hole course with wide forgiving fairways. The view from the 13th tee, which is 3,267ft above sea level, is awesome - you can see the whole course, the lake and island green of the par-3 8th, and the imposing Radstaedter Tauern and Dachstein mountain peaks. The course is surrounded by mountains and forests and located near the medieval town of Radstadt, where partly moated walls, built in the 16th century, still encompass the town centre. Located on a high plateau above the Salzach Valley, the Goldegg GC has great facilities including a driving range with video room, and an impressive clubhouse and restaurant - as have most of the courses. The signature hole is the par-5 12th with its dramatic mountain backdrop, and although the course is not long it is a bit tight, so accuracy is the name of the game here. Don't miss out on an opportunity to visit the village of Goldegg with its two lakes and beautiful castle. Gut Brandlhof in Saalfelden, is another impressive course with fairways that criss-cross a wide river in the narrow Saalachtal Valley with its sheer rockfaces and thick firs. But even more impressive is the adjoining luxury sports and spa hotel with its superb facilities. With equally good facilities is the Hotel Europäischer Hof which is next to the Gastein GC Club at the foot of the beautiful Gastein Alps - another excellent course with stunning views of the often snow-capped Alps, with two very different nines. Then there's Mittersill GC, between the Hohe Tauern National Park and the Kitzbühel Alps, where a small stream will accompany you around the course. Good iron play will be necessary on this course, especially to the island green on the par-3 18th, their signature hole, which is right in front of the clubhouse. And there are some superb finishing holes at the Urslautal GC with its Steinernes Meer mountains backdrop, fairways like carpets, plenty of water, well-guarded greens, and the best sunset in Austria from the 8th hole. Located in one of the most popular holiday regions in Austria, are the parkland Kitzsteinhorn and Schmittenhöhe courses at Zell Am See-Kaprun GC, and Am Mondsee GC by Lake Mondsee - all flat courses with plenty of water. If you want to stay by the water as well as play golf by it, then the Grand Hotel Zell am See is the place - located on a private peninsula jutting into the lake, the hotel enjoys panoramic views over Lake Zell am See and to the mountains beyond. Surrounded by a unique panorama, with an additional nine holes planned in the next three years. A precise game and strategic play is necessary on this course. Doglegs, old hay barns, ponds and streams to tackle, and a lovely par-3 18th island green. Immaculately maintained, and with good practice facilities. All the holes are challenging in different ways - a split-level fairway on the 1st, a small amphitheatre green on the 10th, a small lake and rock wall fronting the 16th green. Accuracy is essential on this short tight course. This course has a blend of shorter par-3s and par-4s to encourage high-handicappers, and tactically teasing longer par 4s and 5s to challenge better players. For the active holidaymaker, SalzburgerLand offers plenty of mountain biking, hiking trails, and water sports. For sightseeing, visit Salzburg - Mozart's birthplace, the medieval bishops residence, Hellbrunn Palace (1612-1615) with its trick fountains, and the Hohensalzberg Fortress (1077). For shopping go to Getreidegasse with its high narrow houses, and for souvenirs - buy anything from Mozart plates and ties, to Mozart cakes and liquors! The hotels mentioned above are renowned for their fine dining, and generally all golf courses have restaurants where there is a wide choice of good food available throughout the day. In the pretty lakeside town of Zell am See there are many hotels with excellent restaurants such as the Grand Hotel, Schloss Prielau, Metzgerwirt, and Lohninghof (more traditional). There is also a very good traditional restaurant in nearby Mittersill - the Meilinger Taverne. In addition to marvellous food, Hotel Restaurant Hindenburg in Saalfelden (hotel-hindenburg.at) has a lovely garden and indoor golf facilities, and Hotel Schloss Fuschl - a renovated 17th century house - overlooks Lake Fuschl (arabellasheraton.com). Just a few years removed from the 2006 Ryder Cup Matches, one thing remains constant: the timeless elegance of the Kildare Hotel, Spa & Country Club. The K Club, as it is known around the world, remains an Irish jewel on 550 acres just 30 minutes outside Dublin. 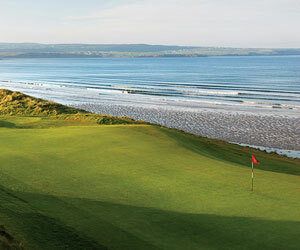 Ireland's "AA Hotel of the Year" for 2011 has lost none of its rock-star appeal, thanks in large part to its two stellar Arnold Palmer-designed courses, Jason Scott Deegan writes.